Richard Richardson (1704 - September 1780) was a colonel of militia as early as 1757 and was in the Cherokee War of 1760-1761. He quelled the insurrection at Ninety-Six in 1775, assisted in the defeat of the British Fleet at Charelston in 1776, and was appointed Brigadier General on March 25, 1778. He was taken prisoner at the surrender of Charleston and paroled. Later, his health failing, he was sent home and soon died. Few men played a more important part in the provincial history of South Carolina. 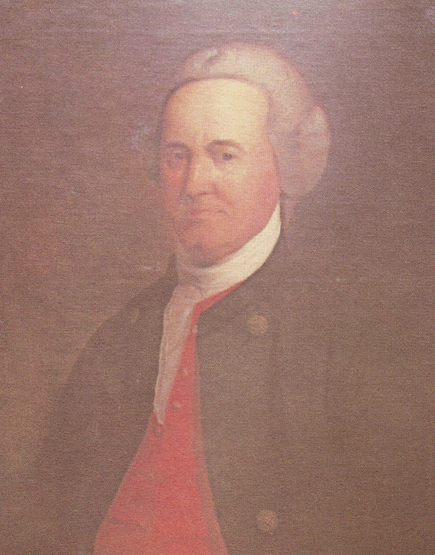 He was repeatedly a member of Assembly, a delegate to the First Provincial Congress of January 1775, a member of the Second Provincial Congress and the first Legislative Council in March 1776; he was colonel of the militia as early as 1757; was in the Cherokee wars of 1760 and 1761, in command of a regiment, was in command of the militia and regulars in the famous "Snow Campaign" against the Tories at Ninety-Six in the winter of 1775; assisted at the defeat of the British fleet at Charleston in June 1776, and commanded the state militia at Purrysburg in December of 1778, having been appointed Brigadier General 25 March, 1778. At the surrender of Charleston in 1780 he was taken prisoner and paroled. Later he was imprisoned, and his health failing he was sent home and soon died. Born in Virginia, Richardson eventually wound up in what is today Clarendon County, South Carolina. He married Mary Cantey. Col. Richard Richardson was granted 1,000 acres in Craven County in St. Mark's Parish on the north side of the Santee River. This was recorded 12-16-1768. Col. Richard Richardson was granted 300 acres in Craven County in St. Mark's Parish on Santee, Futters Earth Creek recorded 12-16-1768. Richard Richardson was a native of Virginia, where he was employed as a land surveyor at the time when Washington was engaged in the same pursuit. He afterward settled in old Craven County in South Carolina, and during the Indian border wars, he commanded a regiment. As a representative in the Provincial Congress of South Carolina, Colonel Richardson assisted in forming the first Republican Constitution of that state. He was with General Lincoln in his Southern campaigns, and with that officer became a prisoner at Charleston, at which time he was a brigadier. With others, he was sent to St. Augustine, from whence he returned in September with a broken constitution, and soon died at his residence, near Salisbury, in Sumter District, at the age of about seventy-six years. Soon after his death, Tarleton occupied his house, and, believing the family plate was buried with him, had his body disinterred. When he was about leaving, that cruel man applied the torch to the house with his own hand, avowing his determination to make it the "funeral pile of the widow and her three young rebels." His son James B. Richardson was afterwards governor of South Carolina.